Director David Giler; writer Giler; featuring George Segal, Elisha Cook Jr.
Humphrey Bogart, Peter Lorre, Mary Astor, Sidney Greenstreet contend for the Maltese falcon in 1941 film. The second version of Maltese Falcon also did okay at the box office, so Warners let John Huston rewrite it and remake it for his first directorial effort in 1941. Huston wisely ignored the immediately prior remake and adopted some of the best scenes from the first adaptation, while adding his own. And his effort became a screen classic, never to be remade again. The male cast is stellar: Bogart as Spade, Peter Lorre as the dapper but creepy Joel Cairo, Sydney Greenstreet as "the fat man" Kaspar Gutman, and even Elisha Cook Jr. as the psychopathic gunsel Wilmer Cook. 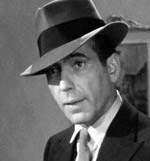 Most of the actors are brilliant, which is to say they all overact effectively, Bogart in particular jumping from trenchcoat cool to tough-guy rages to sentimentality and melodramatic philosophizing. Lorre matches him in going over the top at the drop of a hat. Yet it never annoys, as it does in the 1936 flick, because they're so entertaining. It's all about timing, folks. Mary Astor as Brigid O'Shaughnessy, though, I've never understood. I've never understood in the first place why her character is considered such a looker. Both Gladys George as Spade's overthrown love interest and Lee Patrick as his loyal secretary Effie are more appealing. But what I've really never really got is why Spade would fall for O'Shaughnessy in any case. For the bittersweet ending to really work—for us to feel the pain of Spade's sacrifice—we have to believe he'd been deeply in love with her throughout the film. He does say as much, but we never see it. We saw it in the book but here she's just a lying, conniving client out for herself—and he's aware of it. But it's the writing, direction and cinematography that make this a great—maybe the greatest—detective film. Partway through the film you forget it's a murder mystery as you get caught up in the intrigue among the characters. You get absorbed into the dark atmosphere created by their greed and by the shadowy, angular camera work. It's practically the invention and definition of film noir. The Maltese Falcon was nominated for three Academy Awards: Greenstreet for supporting actor, Warner Brothers for best film, and Huston for the screenplay.